This is a master piece trip of specialization in Nepal. 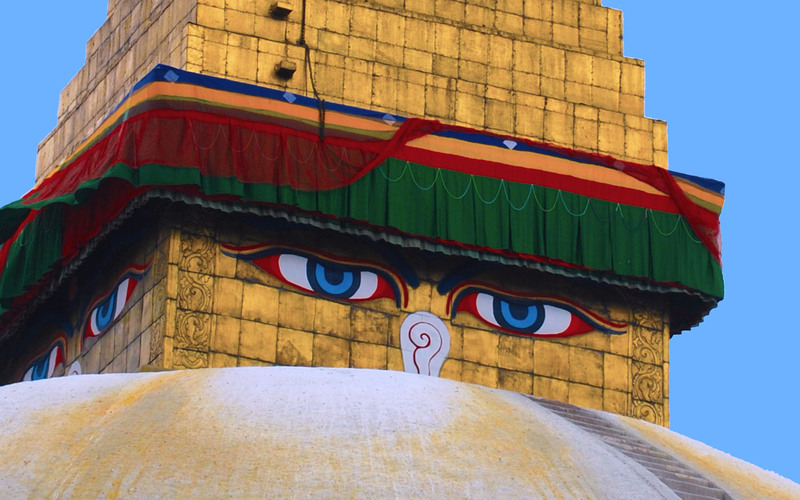 A perfect deal for anyone wanting to see the best of Nepal with blending oneself into the diverse cultures, cities, villages, mountains with gentle walk, a chance to experience the white-water rafting, One Horned Rhino search at Safari Park and finally visit to the birth place of Buddha. Days are packed with new experiences but also with plenty of time to get to know the incredibly friendly locals and relax and enjoy views of the Himalaya. This can can be customized according to your choice, time frame and budget, Please feel free to write to us for customization of this trip. Pickups and drops from hotels and airports in comfortable private vehicle. All ground Transfers in comfortable private vehicle as mentioned in detail itinerary. English speaking, trained and experienced local tour guide. Heritage sites and national park entrance fees. 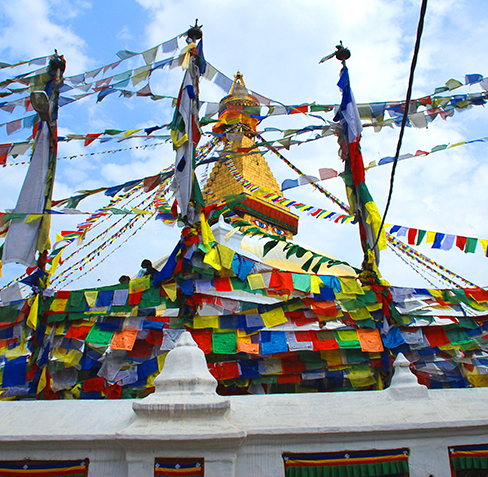 Airfare for international flights, Excess Baggage and Nepalese visa fee. Lunch and Dinner unless Mentioned. Tips for Tour Guide & Driver. Any things not mentioned in Includes. Walking like a local in an old part of the city is an incredible experience. 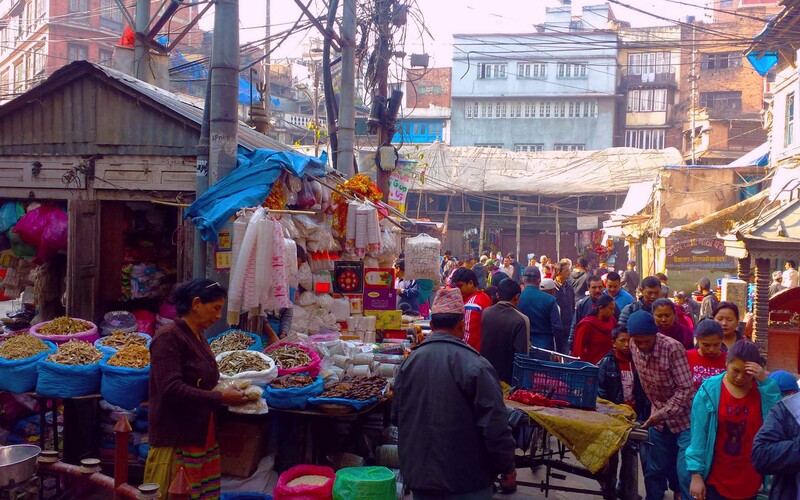 Today we will be visiting the colorful bazaar and the Durbar Square area in the heart of old Kathmandu. This walking tour will start from the streets of Thamel, visiting much of the day to day life of Kathmandu, there we can encounter with a fascinating mixture of people selling fruits, vegetables and spices; potters spinning their wheels to produce small household bowls and containers for temple offerings; we can see lots of temples of different god and goddess on the way, local shopkeepers selling colorful garments, and the ever present sacred cow wandering amongst it all in the streets. In the afternoon we plan to visit the Temple of Pashupatinath on the banks of the Bagmati River, the holiest Hindu shrine in Nepal and also Bodnath, the largest stupa in the country and a destination for Buddhist pilgrims from all over the world. After breakfast, we will visit the almost perfectly preserved city of Bhaktapur (Bhadgaon in the past), which is situated 14 kilometers east of Kathmandu and covers an area of 4 square miles. Bhaktapur means the city of devotees. A lot of pottery and weaving can be found here, as these are the traditional home industries. The Durbar Square of Bhaktapur holds precious architectural pieces like the Golden Gate, the Palace of 55 windows, and the Lion Gate etc. People and the place still remain traditional. 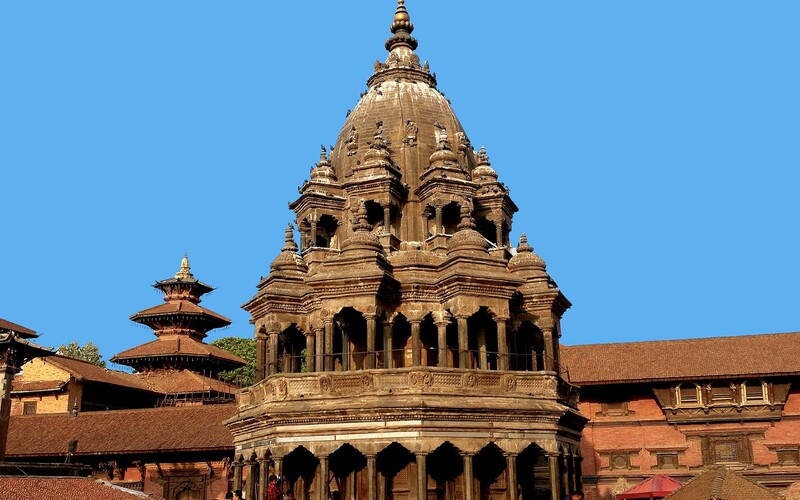 The museum of Bhaktapur contains various old paintings, sculptures, and handicrafts. The residents of this city are highly regarded for their skill in making exquisite woodcarvings and handicraft goods. The third of the medieval city-states in the Kathmandu Valley, Bhaktapur was always described as the best preserved. Tragically, however, the 2015 earthquake caused terrible devastation and loss of life. Nevertheless, only a few temples were destroyed, there is still much to see here, and tourism is vital to the community. We then continue to our Resort at Nagarkot on the Kathmandu Valley Rim. Sunset views from Nagarkot back across the valley to Kathmandu are very impressive. Nagarkot, a beautiful hill station, Thirty five kilometres east of Kathmandu and at an altitude of 2,174 m, Nagarkot stands on a ridge between the Kathmandu valley in the west and the Indrawati valley in the east. We'll get up early to catch the sunrise from the roof of the lodge and after breakfast take a walk to a nearby hilltop along the ridge for spectacular views over the Himalayas. There are many other possibilities for short walks during the rest of the day, including visits to neighbouring farms growing crops of fruit, vegetables and grain, under the spectacular backdrop of the snow capped Himalayan peaks. Drive back to Kathmandu check in hotel. After breakfast, we make an early morning drive out of the Kathmandu valley and descend to the foothills where we overnight at the much lower altitude of about 258 meters. As we leave the valley, on clear days we will have views of the Ganesh, Manaslu and Annapurna ranges of the Himalaya. En route we have the option of a half-day's whitewater rafting on the Trisuli River (Grade III-III+). No previous experience required. (Rafting Includes: All necessary permits, services of experienced river guides, helmet, life jacket and lunch.) As the rafting finishes at the beach just below our accommodation, those who do not wish to raft may relax by the hotel pool. We make our way to the small hill station of Gorkha. ‘GORKHA’ situated at 140km west of Kathmandu at an altitude of 1,135 meter, is the ancestral hometown of the Nepal’s ruling royal family Shah dynasty. It is only 18 km up a paved road of the Pokhara-Kathmandu Highway. The small town perhaps the most important historical town of Nepal. From its hilltop fortress, King Prithvi Narayan Shah, the ninth-generation paternal ancestor of the last King of Nepal, launched his lifelong attempt to unify the independent states of Nepal in 18th century, a wildly ambitious project which succeeded due to his brilliance, and the effectiveness of his locally recruited troops. The British term “Gurkha” evolved from the name Gorkha, referring to the famed fighting soldiers of the region. Walking through local villages and up to the ridge on which stands Shah’s old palace fort is well worth. The view over the surrounding Annapurna and Manaslu ranges is spectacular. Overnight in Gorkha. After breakfast, we continue our journey on to Pokhara situated beside the Phewa Lake beneath the Annapurna range. Upon arrival at Pokhara, we check in our pre-booked hotel. Rest of the day is free for an independent activity. We can venture around the cool lakeside area and find some nice place to have dinner and early to bed is recommended as we will be having a hiking trip to a beautiful hill station next morning. 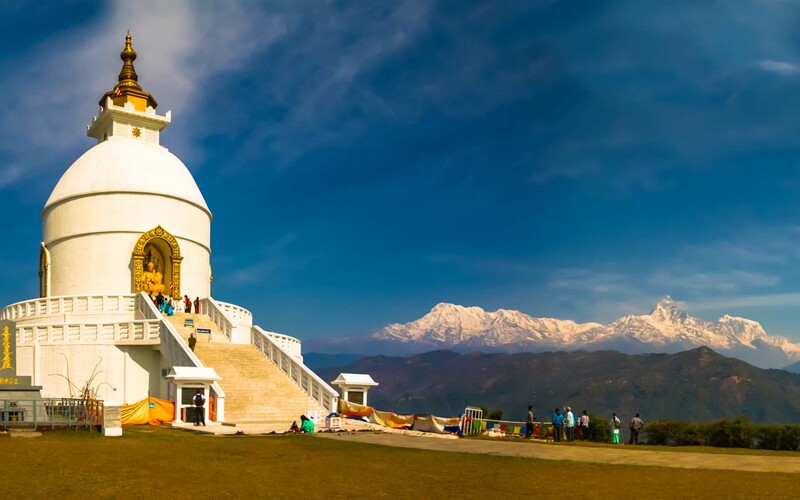 The World Peace Pagoda in Pokhara southwest is a popular destination, situated at an altitude of almost 1000 meters. Visitors can enjoy views of the Himalayan peaks, as well as Phewa Lake and Sarangkot Mountain. On our first morning in Pokhara, we take a walk through some small ethnic settlements to the World Peace Pagoda, situated on a ridge above Pokhara. From here there are spectacular views of the mountains making up the Annapurna range which at this point are only 48km away - from Dhaulagiri in the west to Annapurna II in the east. 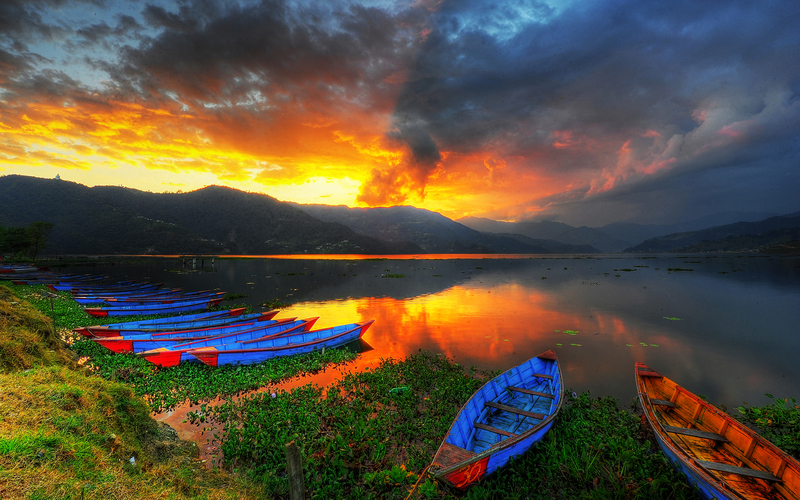 The rest of the day is left free to explore the tranquil town of Pokhara, perhaps taking a boat trip on the lake, or simply sitting back and admiring the breathtaking beauty all around. After breakfast, we will be having a guided tour in Pokhara, first we’ll visit famous International Mountain Museum (IMM), there we get to learn about history of mountain expedition in Nepal and information on ethnic groups, flora and fauna. 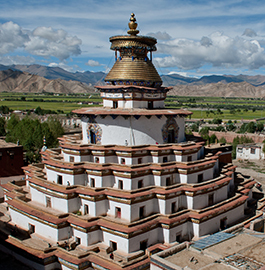 Then We'll visit Tashiling, a long-established settlement of Tibetan refugees. We spend some time here watching wool being sorted, dyed and eventually made into Tibetan carpets which are exported all over the world and then visit to the famous Caves in Pokhara. The first one, Mahendra Cave, located near Pokhara, Kaski district, close to the Seti River, is the large limestone cave. It is a rare example of a cave system in Nepal containing stalagmites and stalactites. The cave attracts thousands of tourists every year. A statue of Hindu lord Shiva can be found inside the cave. Just a ten minutes walk from the Mahendra Cave, there is another cave named the Bat Cave. As the name suggests, it is named after the bats as there is the prevalence or the habitats of the bats over the cave's wall and the ceilings. Apart from its attraction, it is also rich in greenery as the surroundings of the cave is covered by the forest. Leaving Pokhara we take a short drive to the hilltop town of Bandipur. After a short walking tour of the town and the bazaar there is free time to explore this traditional Newari town. Bandipur is a small, quiet town that doesn't attract as many tourists as nearby Pokhara. 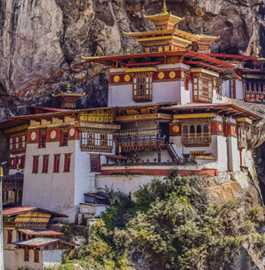 There are several small temples to visit and stunning views back across the Himalaya. Siddhi Cave is yet another attraction in Bandipur. Option of walking downhill to the main highway via visit to siddhi cave next morning. Today we drive from Bandipur to Chitwan National Park. Once a private hunting ground, Chitwan is now a National Park, with thick tree cover and tall elephant grass sheltering a wealth of animals, most famously the one-horned Rhino. Our lodge is located just across the Rapti River, outside the park, near the village of Baghmara. Upon Arrival at Chitwan, The Jungle Lodge staffs will guide us to our designated room and Lunch will be served by 1:00 pm. From 3:00 pm to 8:00 pm we will be occupied by safari lodge package activities like village tour to a nearby ethnic Tharu village where you will learn more about the life and lifestyle of the Tharus. Visit to the National Park Visitor’s centre where you can learn more about the history of the National Park and about wildlife & Sun set view from the bank of Rapti River. And of course one of the entertaining event at the evening is Tharu cultural dance presentation (which we will also participate in) by the local villagers or Slide show presentation on almost everything under the Chitwan. The second day in Jungle Lodge, There will be a wake up call in at 6:00, Followed by breakfast at 6:30 and rest of the day will be occupied by activities like Canoe ride, Bird Watching, Jungle Walk, Elephant bathing, Elephant Safari , An excellent opportunity to see four different kinds of deer, rhinoceros, wild boar, monkey, leopard, sloth bear and Royal Bengal Tiger (If lucky). We will also encounter many other smaller mammals that have made Chitwan their home. 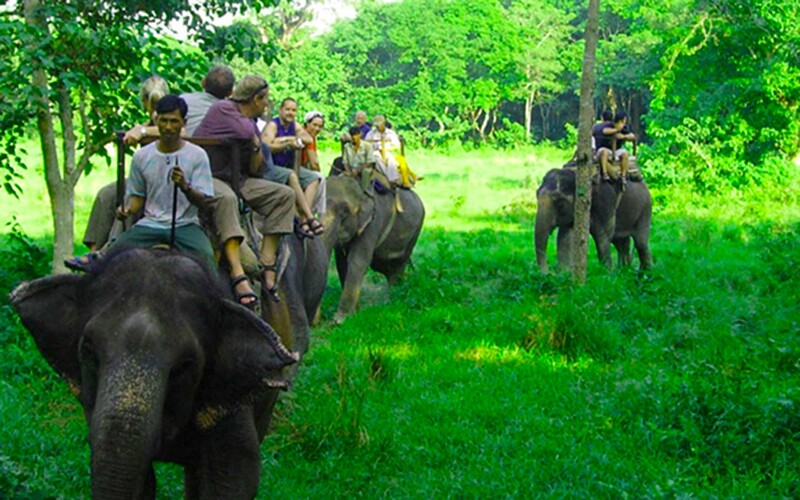 Take an early morning nature walk in Chitwan and after breakfast the jungle activities ends and we carry on our journey to the birth place of Lord Buddha, The holiest ground for Buddhist pilgrimage from all over the world 'Lumbini'. Upon arrival at Lumbini, we will check in to our pre-booked hotel. Free evening to explore the locality nearby the hotel. The Lord Buddha was born in 623 BC, testified by the inscription on the pillar erected by the Mauryan Emperor Asoka in 249 BC. 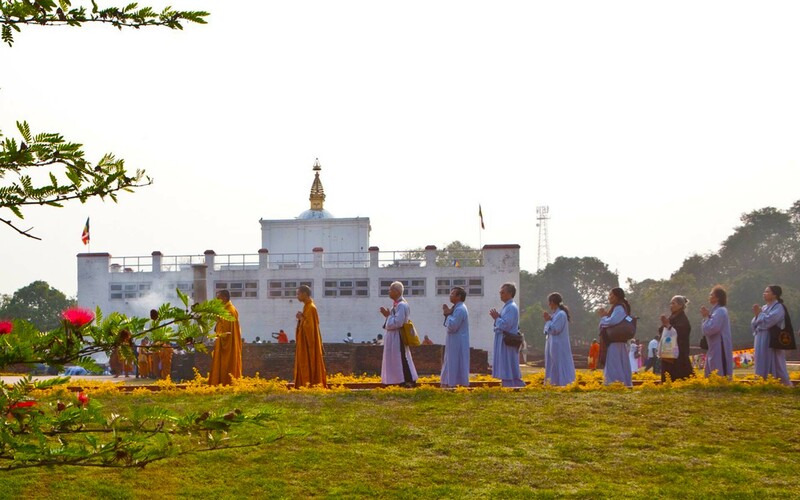 Lumbini is one of the holiest places of one of the world's great religions, and the remains relics of ancient monasteries contain important evidence about the nature of Buddhist pilgrimage centers from as early as the 3rd century BC. Another main attractions are the Mayadevi Temple and the sacred pond Puskarni located south of the pillar. It is said that Mayadevi took a bath before giving a birth to Buddha. After Breakfast, we drive back to Kathmandu and check into our pre-booked hotel. In the evening we will be having farewell dinner hosted by Travel House Nepal. The rest of the day is free for independent activities, relax or do some souvenir shopping or can explore any other areas of Kathmandu. Let us know and we can arrange for that. Our adventure in Nepal comes to an end today! After Breakfast, Free till departure transfer to the airport to connect with the onward flight. Return home to tell the tale of legendary adventure. Every effort will be made to keep to the above itinerary; however, since this trip entails travelling in country side, we cannot guarantee that we will not deviate from it. Weather conditions, health condition of a group member, unexpected natural disasters, etc., can all contribute to changes in the itinerary. The guide will try to ensure that the trip runs according to plan, but please be prepared to be flexible if required. As mentioned in detail Itinerary.